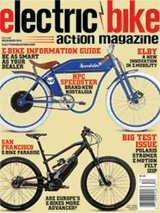 KTM BRINGS THE FREERIDE E-XC ELECTRIC MOTORCYCLE TO THE U.S.
KTM has officially started selling their electric motorcycle, called the Freeride E-XC, in the U.S. after a lot of R & D by American riders. It’s been for sale in Europe for a few years now. The U.S. KTM corporation and dealers have been working together and learning what will work for the American market. The bike is based on the KTM 25 Freeride 2-stroke platform, with a chromoly/aluminum composite frame, high-strength polyamide/ABS plastic subframe and an a cast aluminum swingarm. The Li-ion battery is removeable/swappable, and carries enough charge for about an hour of riding, and requires up to 80 minutes to recharge (using 220V, and requires a pure sine wave inverter or home set-up 220V, not a modified sine-wave setup like that of most generators). If you had two batteries, you can swap them and take short breaks between and ride as much as you’d like. An extra battery will run you $3800. The process is easy, just flipping up the seat and undoing four bolts. The battery slides out and the new one slides in precisely. This thing was designed by motorcycle mechanics, and the precision becomes obvious. We were given an opportunity to ride it recently, and it’s just flat-out fun! The three levels of power delivery let you dial in the throttle response. We were at an OHV area in Wildomar, California, just south and east of Los Angeles. It was loose and dusty, and the bike handled it with aplomb! 250mm of travel front and rear were ample for all but the biggest ruts, and climbing power to cruise up anything. This is designed like a trials bike, made for trails moreso than tracks. KTM knows how to make a great motorcycle, and then adding to that a powerful electric motor and the ability to easily swap batteries to keep riding is fantastic. It’s still strange to ride without the “BRAAAAP” of a gas motor, and the throttle response is different in an electric motor. We’ll have more on the bike in an upcoming issue. Stay tuned!